Very detailed map of part of Hackensack (2 of 2), New Jersey, showing property boundaries, owners' names and individual building footprints. 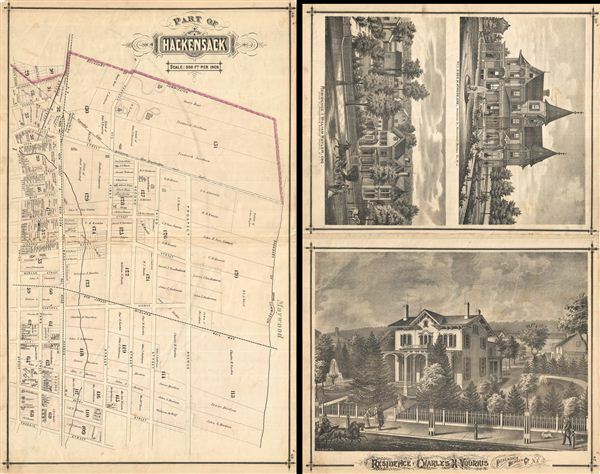 Published as plates 48-49 in Walker & Pease's exquisite 'topographical, illustrated, historical, descriptive' Atlas of Bergen County, New Jersey, 1876. Verso contains beautifully rendered views of the residences of Charles Voorhis, George Atwood, Esq., and William Huyler, Esq., all enlivened with men, women and children walking, talking, and playing, and horses and carriages in motion.